The Cascade Mountains take up a large chunk of the state of Washington, separating the wet and mild western section from the dry and more extreme climate of the east. Major peaks in this mountain range include Mount Rainier, Mount Baker, Mount Adams, and Mount St. Helens. This makes Washington a great place for anyone looking for a mountain getaway. Mountain resorts make for wonderfully refreshing getaways. Whether you want to find a comfy seat on the porch to take in a fabulous view or to get out and hike to a waterfall and viewpoint, there is something to appeal to everyone. These Washington resorts offer the full package—stunning mountain locations, quality accommodations, nice dining options, and a variety of on-site and nearby activities. Located on the sunny eastern side of the North Cascades, Sun Mountain Lodge is a full-service resort that offers a variety of accommodations and a long list of facilities and activities. The resort complex is sprawled across a large property crisscrossed with recreation trails. Well-appointed guest rooms are located in the main lodge and the nearby Gardner and Mount Robinson buildings. Luxurious cabins overlooking Paterson Lake, complete with kitchens, are nearby. Fine mountain-view dining featuring fresh local products is available in the Sun Mountain Lodge Dining Room. The Wolf Creek Bar & Grill serves an equally delicious menu in a more casual environment. After a day spent hiking local trails or shopping charming downtown Winthrop, you can enjoy a hot stone massage or rejuvenating facial at Sun Mountain's spa. Outdoor pools, tennis courts, a recreation room, a gift shop, open lawns, picnic tables, and indoor and outdoor seating areas are among the on-site facilities where you'll enjoy spending time with friends and family. Suncadia Resort is just an hour east of Seattle in Cle Elum. Both a resort and a community, Suncadia has everything you need on the property and is also convenient to the year-round recreation available in nearby National Forests and Washington State Parks. Perched in the eastern foothills of the Cascade Range, this resort offers splendid territorial views that include vast forests and the Cle Elum River. The range of experiences you can enjoy at Suncadia Resort makes it suitable for all kinds of getaways: family vacations, romantic retreats, girlfriends weekends, and man-cations. The accommodations for resort guests are found at the rustically-elegant The Lodge at Suncadia or the more intimate The Inn at Suncadia. Renting a grand vacation home is another option. Major facilities at Suncadia include the Glade Spring Spa, three golf courses, the Swim & Fitness Center, and miles of hiking and biking trails. Situated along Icicle Creek just outside of Leavenworth, Sleeping Lady Resort is a haven of beauty, both natural and human-made. The resort has a colorful history. In the past, the lands and buildings have served many people and many functions, from Civilian Conservation Corps camp to Catholic retreat. Today it is a complex that includes lodgings, several dining options, and the Solstice Spa. Sleeping Lady guests can enjoy a variety of indoor and outdoor spaces, from the library and fitness room to the organic garden, outdoor pool, and badminton/volleyball court. Wonderful works of art are scattered throughout the grounds and facilities, combining with the gorgeous mountain surroundings to make the resort a refreshing escape that you'll want to repeat again and again. Guests at Skamania Lodge will enjoy gorgeous Columbia River Gorge views, elegant accommodations, and access to on-site and nearby recreation. Massages, facials, and body treatments are on the menu at Skamania's Waterleaf Spa and Terrace, which also offers indoor and outdoor soaking pools. Miles of wooded hiking trails wind through and around the Skamania Lodge Golf Course. Fine dining is available in the Cascade Dining Room, with casual fare on the menu at the River Rock - both come with great views. If you want to get out and explore, you'll find that the nearby Gifford Pinchot and Mt. Hood National Forests, along with the Columbia River Gorge National Recreation Area, offers all the adventure and scenery you could ask for. While the rooms at this historic park lodge are modest, the Mount Rainier setting ranks among the most spectacular in the world. Located on the mountain slopes at 5,400 feet elevation, amazing views are available in every direction. Open from late May through September, Paradise Inn's charming common areas include a grand lobby filled with handcrafted furnishings and a huge fireplace. The mezzanine that wraps around the lobby is a great place to take in the rustic architecture and hand-painted wildflower hanging lamps. Meals are available in the Dining Room and at the cafeteria in the nearby Paradise Jackson Visitor Center. The best thing about staying at the Paradise Inn is the access to miles and miles of local trails that pass by creeks and waterfalls, through wildflower-filled meadows, and towards ever-changing and magnificent vistas. 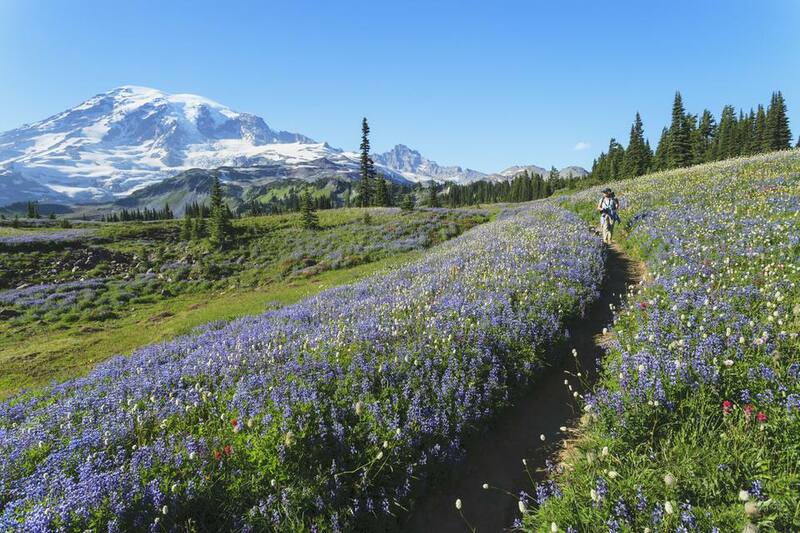 Whether you love playing in the fresh snow or hiking among the alpine wildflowers, this year-round resort at the edge of Mount Rainier National Park is the perfect mountain playground. A relatively small resort, Alta Crystal Resort offers lodge-style suites along with access to a wealth of outdoor recreation and gorgeous mountain views. In the winter you can spend the day skiing or snowboarding and return to Alta's heated outdoor pool and hot tub and your in-suite fireplace. Hiking and horseback riding are among the summer fun that can be had in the forest and parkland​ surrounding the resort. You can dine in your suite's kitchen and dining area; groceries are available on-site, or you can choose to have pre-cooked meals delivered to your refrigerator to heat up when ready. For a special treat, take the new Mt. Rainier Gondola and enjoy dinner at the Summit House Restaurant.